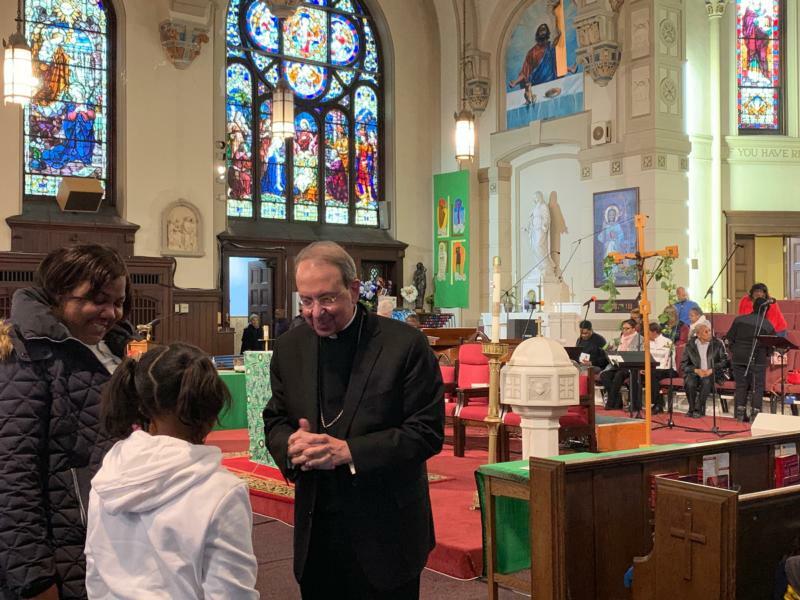 BALTIMORE (CNS) — Baltimore Archbishop William E. Lori has issued his second pastoral reflection in 12 months on the effects of racism on society. Titled “The Journey to Racial Justice: Repentance, Healing and Action” the pastoral was released at St. Bernardine Parish in West Baltimore Jan. 21, the day the nation commemorates the birthday of the Rev. Martin Luther King Jr. The civil rights leader was born Jan. 15, 1929, and assassinated April 4, 1968. “Even as we Americans celebrate the inspiring example of Dr. King today, we feel the shame of witnessing public demonstrations of racism, anti-Semitism and intolerance toward newcomers to our country such as we have not seen in decades,” Archbishop Lori said at St. Bernardine. “Likewise, there seems to be no lessening of the institutional racism we see all around us — whether in the criminal justice system, employment, health care, education or political enfranchisement,” he said. The announcement of the pastoral was to have been followed by a peace walk through the neighborhood, commemorating eight recent homicide victims in the area. However, due to the city’s “code blue” warning because of the subzero wind chill, the prayer service was held indoors, during which Deacon W. Paul Barksdale read the homicide victims’ names. The program concluded with the Holy Spirit Prayer and the Prayer of St. Francis of Assisi. The archbishop’s reflection comes on the heels of the U.S. bishops’ second pastoral letter against racism — “Open Wide Our Hearts: The Enduring Call to Love” — approved in November, and acknowledges the local church’s history of enslavement of persons and other racial inequities. In his new pastoral reflection, the archbishop noted the recurrence of racial and ethnic violence and hatred in ways that have not been seen in decades. “Whether racism manifests itself in these blatant offenses against the dignity and humanity of people of color, or more subtly in the systemic racial inequities that persist in our current society — in the criminal justice system, in employment, education, housing, health care and political enfranchisement — the national conversation confirms that there is still a great deal of work to be done,” Archbishop Lori said. His pastoral acknowledges that churches and members of the clergy, including four archbishops of Baltimore, held enslaved persons. “Records show that lay members, religious communities and individual clergy held enslaved persons and that the church benefited from their labor not only in general parish work — the maintenance of churches, residences, convents, cemeteries, and so on — but also from the profit of their labor on plantations and farms owned by church entities,” the archbishop wrote. The pastoral notes that the church cannot become complacent in its efforts to fight racial injustice. “Have we lapsed, like our society at large, into a situation of de facto segregation? If we can still easily identify the ‘black’ and ‘white’ parishes of our archdiocese, have we truly accomplished the goal of racial equity we claim to embrace?” the document asks. The pastoral reflection includes concrete steps to be taken by the archdiocese, including: organizing training and resources to discuss and address the issue of racism; examining the diversity of archdiocesan institutions, parishes, schools and social service programs, and enhancing efforts to further diversify where needed; and strengthening existing efforts to attract new members of the church and candidates for priesthood and religious life from diverse racial and ethnic backgrounds. Skipp Sanders, former executive director of the Reginald F. Lewis Museum of Maryland African-American History and Culture and a parishioner of St. Vincent de Paul in Baltimore, assisted the archdiocese with the drafting of the pastoral. Read the full text of the Archbishop Lori’s pastoral reflection. Gunty is associate publisher/editor of Catholic Review Media, the media arm of the Archdiocese of Baltimore. Paul McMullen, managing editor, contributed to this story.